Combating the rising tide of extreme weather events. The start of 2014 saw widespread flooding across large parts of the UK and huge numbers of workplaces were thrown into chaos with many suffering severe damage to premises and stock, major disruption and even financial ruin. According to The Met Office, the period between December and February was the stormiest weather to hit the UK for 20 years. This followed several other harsh winters where freezing temperatures and snow brought the country to a standstill for weeks at a time. New research from a collaberation between Newcastle University and The Met Office has also found that summer downpours and subsequent flash flooding are set to become more prevalent in the future due to the effects of climate change. It’s difficult to quantify the disruption to businesses from this type of weather because aside from the obvious flood damage, there can be endless other problems ranging from employees not being able to get to work through to wrangles with insurance firms that can jeopardise the future of a business. 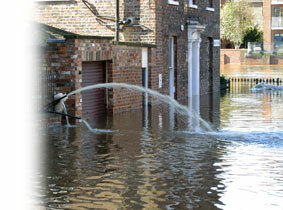 Research by the Federation of Small Businesses highlights just a few of the problems caused by last winter’s floods. The organisation found that 32% of small businesses in flood-hit areas experienced reduced demand for their services, 29% suffered transport and delivery disruption and 16% were affected by staff absences. For organisations in premises that are at risk of flooding, or those that are heavily reliant on good weather, it is vital to have a business continuity plan in place that focuses on making sure that a business can carry on as usual when severe weather hits. The most important aspect of a continuity plan is to consider the health and safety of employees, which always has to remain a priority. This could mean making sure that gas and electricity supplies can be quickly and easily isolated or ensuring that employees working outside in harsh weather have the equipment and clothing to operate safely and efficiently. The other focus of the plan needs to be how to minimise damage, perhaps by using sandbags, water pumps and flood barriers, which can all greatly reduce the amount of water entering a property. Contingency planning is also essential and in today’s technologically reliant world it is often possible to switch telephone systems to temporary office spaces and work remotely using laptops and mobile phones. It is also important that you decide how to communicate with employees, customers and suppliers, and designate individuals to initiate the communication process to staff, in the event that you are unable to access your premises.